Greek banks are set to re-open on Monday following a three-week "holiday". 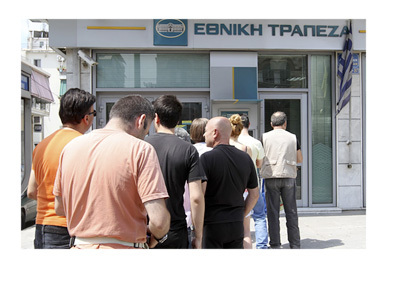 Long lines are expected as Greek citizens queue up to take out up to 420 Euros per week from their accounts. A few weeks ago, Greek banks were shuttered after Prime Minister Alexis Tsipras announced that the country would be holding a referendum to determine whether or not it would agree to new austerity measures in exchange for some more emergency funding and liquidity. The people emphatically voted "no" to new austerity measures, and Tsipras was sent back to the bargaining table with a mandate to negotiate an improved deal for his people. Greece, however, had absolutely no leverage, besides the threat of a possible "Grexit", and eventually agreed to austerity measures anyways in exchange for emergency liquidity. Greece's creditors were clear - you need to agree to these austerity measures (including higher taxes and some pension cuts), despite what your people may think or want. Tspiras acquiesced and a deal was signed. Now, the two sides will look to begin negotiations on a third bailout deal. In the meantime, Greek banks are set to re-open on Monday, though capital controls and withdrawal limits are going to stay in place for the time being. According to reports, Greek citizens are going to be allowed to withdraw up to 420 Euros per week (previously there was a 60 Euro per day limit, though things have been changed somewhat). After three weeks of a Greek bank "holiday", extremely long lines are expected at Greek banks on Monday and throughout the rest of the week. Some Greek officials are imploring Greek citizens to put their money back into the banking system (many people are hoarding their cash at home) in order to stabilize the economy. German Chancellor Angela Merkel has called for "swift aid talks" so that Greece can lift its withdrawal limits and return to some fashion of normalcy. The situation remains extremely unstable in Greece, with many citizens and politicians openly defiant against the recent deal that was agreed to by Alexis Tsipras. It stands to reason that increased austerity measures will be a part of any future bailout deal, which should go over like a lead balloon in the country.